Come out to the launch of D.G. 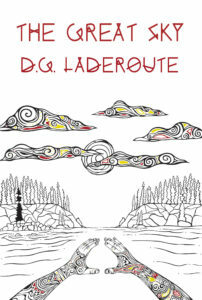 Laderoute’s latest novel, The Great Sky! The first time Piper Preach died he was ten years old. But the Anishnaabe spirits thought otherwise. Now, six year later, Piper struggles with the hard realities of life in a big city. The ancient ways of his people are a distant memory. But the spirits aren’t done with him. Pulled into their bizarre world, the place the Anishnaabe call The Great Sky, he’s plunged into the middle of a brutal war raging just a step away from reality. And this time there may be no escaping death – or even worse. You’ll be able to buy the novel, hear a reading or two by the author…oh, and there’ll be cake! The event is to be held at The BookShelf, 920 Memorial Ave., Thunder Bay, Ontario, Tuesday, October 18, 7:00 PM.